Lumbar radiculopathy or sciatica represents one distinct presentation of low back-related leg pain, which is generally characterized by pain radiating to below the knee and into the foot and toes. Low back pain is very common presentation in general practice and sciatica represents 10% of these patients. Sciatica has a lifetime incidence of between 13-40% however up to 86% of episodes will resolve with aggressive non-operative therapies. Small lumbar disc herniations are commonly seen on imaging in patients who are asymptomatic and do not require treatment. Most common causes of radiculopathy include disc herniation and lumbar canal stenosis. History, examination and MRI are important for accurate diagnosis. Most patients will improve with conservative management within 6 to 12 weeks. Conservative options include analgesia, physiotherapy and transforminal injections. Surgery is recommended for patients who fail conservative treatment and for weakness. The most common surgical procedure for sciatica is a micro discectomy and this generally has good outcomes. 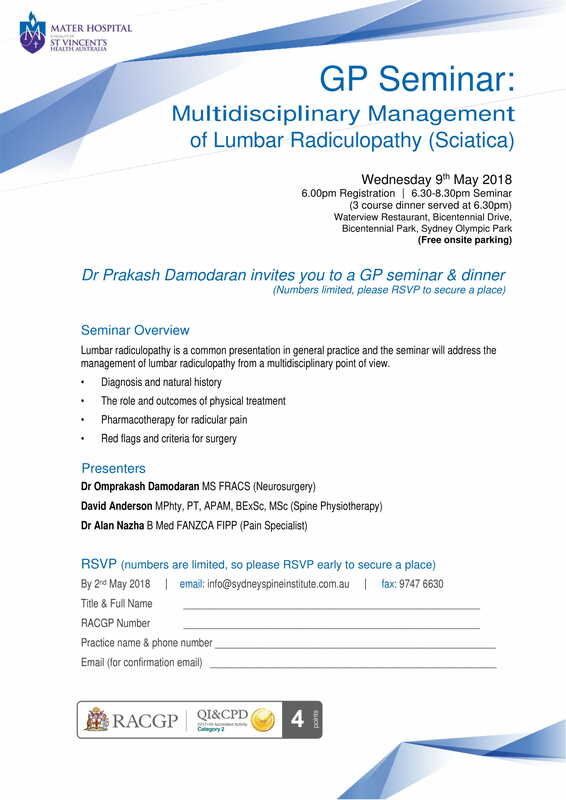 Dr Omprakash Damodaran (MS FRACS) is an Australian trained neurosurgeon with extensive surgical experience in the management of brain tumours, degenerative spine and peripheral nerve conditions. Dr Damodaran is a VMO at Concord Repatriation General Hospital. He consults at the Sydney Spine Institute in Burwood and Campbelltown. David is a consultant physiotherapist with extensive experience in both acute and chronic spinal conditions. He is also trained in Clinical Exercise Physiology. David is currently completing his PhD at the University of Sydney on a world-leading trial of spinal surgery. He consults at the Sydney Spine Institute. Dr Alan Nazha is a Specialist Anaesthetist consulting in pain management. He completed his anaesthetic fellowship at Royal North Shore Hospital in 2011 and has also completed core training for his pain medicine fellowship at Royal North Shore Hospital and Concord Repatriation General Hospital. He consults at the Sydney Spine Institute.